In this edition, John offers an insight into the rules on the quick-tap penalty, takes a look back at the survivors of Wales' victories over the All Blacks and ponders where the British & Irish Lions would sit in the world rankings. A. Law 21.7 covers what the opposing team must do at a penalty kick, with sections (c) and (d) referring to the quickly taken penalty (the so-called tap-and-go). If a penalty is taken so quickly that an opponent has no chance to retire ten metres, section (c) of the Law states "they will not be penalised for this. However, they must continue to retire … or until a team-mate who was 10 metres from the mark has run in front of them, before they take part in the game." Section (d) goes on to cover subsequent interference as follows: "The opposing team must not do anything to delay the penalty kick or obstruct the kicker. They must not intentionally take, throw or kick the ball out of reach of the kicker or the kicker's team mates." The sanction for any infringement is a second penalty kick, ten metres in front of the mark for the first kick. The Law goes on to say "Any player may take the kick. The kicker may change the type of kick and may choose to kick at goal." It adds, however: "If the referee awards a second penalty kick, the second penalty kick is not taken before the referee has made the mark indicating the place of penalty." Each team, therefore, has to adjust to the pace of the referee before the second penalty can be taken and that's why, in practice, consecutive tap-and-go penalties are not seen. A. Wales have only beaten New Zealand three times: in 1905 (3-0); 1935 (13-12) and 1953 (13-8). Willie Llewellyn was the last survivor of the 1905 side. He died at Pontyclun (Wales) in 1973 aged 95. Haydn Tanner, whose passing was recorded in June, was the last of the 1935 team. There are six survivors of the 1953 team: John Gwilliam, Courtenay Meredith, Billy Williams, Gareth Griffiths, Gwyn Rowlands and Cliff Morgan. 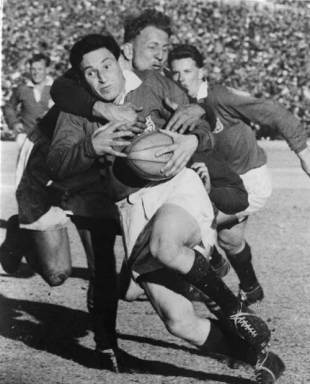 Gerwyn Williams, Wales's fullback in the last win against the All Blacks, died earlier this year and Bleddyn Williams, who captained the side, passed away earlier this month. A. John Dougan's try opened the scoring in the first Test between New Zealand and Australia at Athletic Park, Wellington on 19 August 1972. He took his chance early in the game when Sid Going went to the blindside off a five-yard scrum. That score was the first four-point try by New Zealand in international rugby, not the first four-pointer in a Test. The All Blacks went on to win 29-6. The scoring value had been changed the previous September (1971) and first came into practice during the northern hemisphere season of 1971-72. The All Blacks had not played a Test in the interim, though it was Australia's fifth under the new scoring values. The first Australian to score a four-pointer had been Dave L'Estrange against France in their 13-11 win at Toulouse on 20 November, 1971. A. Peter Brown, the elder brother of Gordon and son of the Scottish soccer international goalkeeper, Jock Brown, played lock and No.8 for Scotland between 1964 and 1973. He scored 67 Test points, the most by any Scotland forward to date. His haul comprised fifteen penalty goals, six conversions and three tries - two worth three points and one, in 1972 against England at Murrayfield, worth four. His most important successful kick was the late conversion of Chris Rea's try against England at Twickenham in 1971 to give Scotland their first win there (16-15) since 1938. Peter captained Scotland that day and scored one their three tries. Earlier the same season he had hit the post attempting to convert another late Chris Rea try, against Wales at Murrayfield that gave Scotland an 18-14 lead. An even later Gerald Davies try in the right corner, converted from near the touchline by flanker John Taylor, gave Wales a 19-18 win in one of the most thrilling matches ever staged in the old Five Nations. Peter Brown's technique was arguably the least fussy of any Test place-kicker. He simply put the ball on the mark, turned his back on it as he walked back, and then took a round-the-corner approach before smacking the ball goalwards. A. Great story. Perhaps he had read the nineteenth century Irish rugby critic Jacques MacCarthy's contribution to Rev Frank Marshall's 1892 classic Football: The Rugby Union Game? MacCarthy introduced the chapter on Irish rugby by writing: "Football in Ireland may be said to consist of three parts - Rugbeian, Associationist, and Gaelic. The rule of play in these organisations has been defined as follows:- In Rugby, you kick the ball; in Association, you kick the man if you cannot kick the ball; and in Gaelic, you kick the ball if you cannot kick the man." A. The IRB's official rankings take into account all Test matches played between member Unions. The rankings are carefully weighted however to give most recent results higher ranking points. As the Lions are not an individual Union, their matches do not figure in the analyses. New Zealand, South Africa and Australia currently (on the eve of the 2009 Tri-Nations tournament) fill the top three places in the rankings. It will be seen from the following table summarising the Lions' overall Test results against the SANZAR nations that a reasonable ranking might be somewhere between the Springboks and Wallabies. Despite the fact that Australia have won their last two Tests (2001) against the tourists, the weight of history is in the Lions' favour in their Tests with the Wallabies. * Excludes the three-Test series of 1908 between New Zealand and the Anglo-Welsh tourists of 1908, when Scotland and Ireland refused to support the tour. The All Blacks took that series 2-0 with one Test drawn.